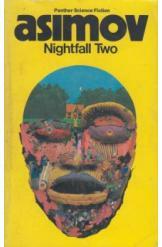 Nightfall Two by Isaac Asimov. The book is in a good condition, all pages intact. This is the second half of the largest collection of Asimov's short sci fi fiction stories. The stories include: In a Good Cause; What if; Sally; Flies; Nobody Here but; It's Such a Beautiful Day; Strikebreaker; Insert Knob A in Hole B; the Up to Date Sorcerer; Unto the Fourth Generation; What is This Thing Called Love? ; The Machine that Won the War; My Son the Physicist; Eyes Do More than See; Segregationist.